College of the Ozarks has been named to the 2013 President’s Higher Education Community Service Honor Roll, the highest federal recognition a college or university can receive for its commitment to volunteering, service-learning and civic engagement. The Corporation for National and Community Service, which administers the annual Honor Roll award, recognized more than 700 colleges and universities for their impact on issues from poverty and homelessness to environmental justice. On campuses across the country, thousands of students joined their faculty to develop innovative programs and projects to meet local needs using the skills gained in their classrooms. Business students served as consultants to budget-strapped nonprofits and businesses, law students volunteered at legal clinics, and dozens of others organized anti-hunger campaigns. The Honor Roll includes six colleges and universities that are recognized as Presidential Awardees, with an additional 690 schools named as Honor Roll members. Honorees are chosen based on a series of selection factors including the scope and innovation of service projects, percentage of student participation in service activities, incentives for service, and the extent to which the school offers academic service-learning courses. College students make a significant contribution to their communities through volunteering and service, according to the most recent Volunteering and Civic Life in America report. In 2012, 3.1 million college students dedicated more than 118 million hours of service across the country — a contribution valued at $2.5 billion. The Corporation oversees the Honor Roll in collaboration with the Department of Education, the Department of Housing and Urban Development, Campus Compact and the American Council on Education. College of the Ozarks culinary art students placed second in the American Culinary Federation Missouri State Student Team Competition. 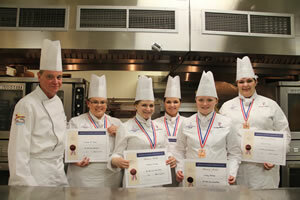 The competition was held at the Culinary Institute of St. Louis at Hickey College in March. The team, led by Executive Chef and Assistant Professor Robert Stricklin, included five students from College of the Ozarks: junior team captain Joy Hunt, junior Hannah Burke, sophomore Lindsey Whitener, freshman Davina Jutras and freshman Hadassah Hirscher. Judges evaluated cooking techniques, sanitation, work flow, team work, classical cooking, methodology, plate presentation and taste. The competition encompassed testing the student’s individual skills, as well as a team preparation of a four-course meal. All students involved met once week for practice and planning in a hotel and restaurant management/culinary arts competition class. OH WHAT A NIGHT! 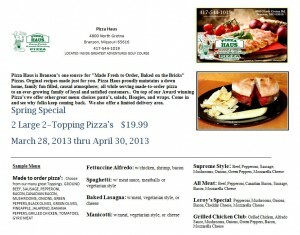 A musical tribute to Frankie Valli and The Four Seasons! RETURNS April 1st! The number one Frankie Valli Tribute in Branson returns for it’s third season at The Andy Williams Moon River Theatre on April 1st! Andy Williams first presented these incredibly talented singers to Branson and they have been a HIT ever since! These amazing singers put on a terrific show that you will not want to miss featuring all the hits from the dynamic songbook of those boys from Jersey. Including Sherry, Big Girls Don’t Cry, Grease, and more! Enjoy humor, dancing, and amazing vocals from the best Frankie Valli show in town. 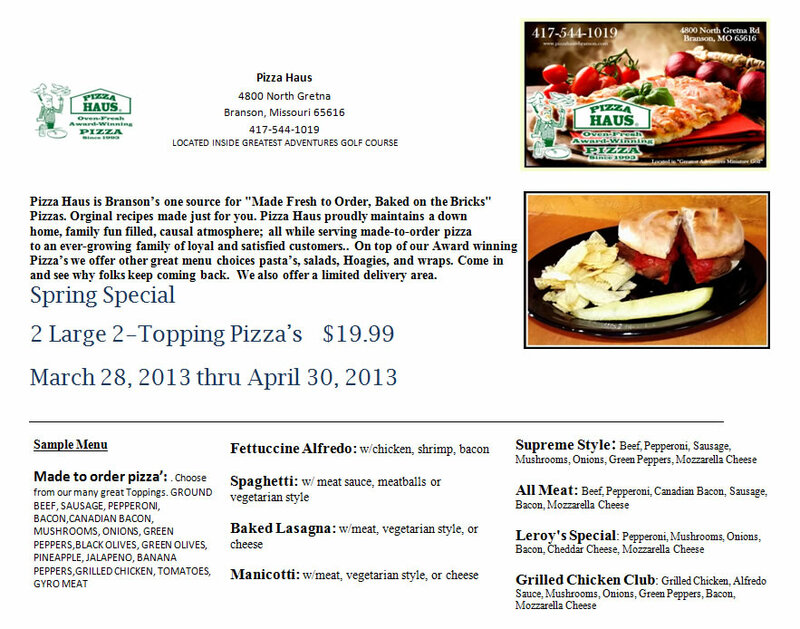 Area appreciation for Stone and Taney County April 1 through April 6th! 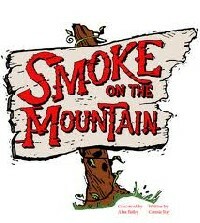 “Smoke On The Mountain” Opens 2013 Season This Week! Celebrating 16 Years in Branson, Missouri ~ “Smoke On The Mountain” (an Off-Broadway musical comedy that was written by Connie Ray and conceived by Alan Bailey) opens it’s 2013 Season at the Little Opry Theatre at the Imax this week ~ Tuesday through Saturdays at 8:00 pm starting March 26th, 2013! .. Laughter rolls in like the morning fog in the Ozark Mountains! SMOKE ON THE MOUNTAIN, is a magnificent blend of story and song. This smash hit is the dazzling jewel of Branson is celebrating its 16th anniversary season with a headlining show time of 8:00 PM. So treat yourself to the only live “musical theatre” in town! Let us take you back to a simpler time, 1938, where you become the congregation of Mount Pleasant Church. You have been invited to their “first ever Saturday Night Sing”. Pastor Oglethorpe is determined to move his flock into the “modern world”, by inviting the Singing Sanders Family to join him. They will delight you with some of the best old gospel tunes ever written, like “Church in the Wildwood”, “Wonderful Time Up There”, and “I’ll Fly Away”. “Vocal performances are astounding-clear, rich in a perfect blend of harmony…”says Rene Ray of the Shepherd of the Hills Gazette. In SMOKE ON THE MOUNTAIN, the musical talent is surpassed only by the side splitting hilarity of these characters. You have at least one of them in your own family! It’s no surprise why SMOKE ON THE MOUNTAIN has become one of the most produced shows in the country. It’s success has spread like wildfire! There is nothing else like it in Branson! We will also perform SANDERS FAMILY CHRISTMAS the sequel to SMOKE ON THE MOUNTAIN, during the 2013 Holiday Season. So Ya’ll come out and see us soon! SMOKE ON THE MOUNTAIN and Branson,MO – a match made in heaven! In agreement with Samuel French, Inc. Call 1-800-419-4832 or 417-335-4832 for tickets and booking information! Our show is mobile and available for road shows for your next special event or church social! Contact Catfish for “road show” information and availability. You are also welcome to “like” our Facebook page for current updates and pictures of our production. Ozark Mountain Legacy recognizes that many people come to visit this area year after year because of the legacy of hospitality that characterizes Ozark Mountain Country. However, they also acknowledge that in order to pass on that legacy to the next generation of visitors, business leaders must commit to practices that reflect their core values, and the core values of the community—family, faith, friends, flag, and ensuring a preferred future. Business leaders who attended last week’s PARAGON workshop also plan to send their front-line employees to Legacy University’s “FACETS Front Line Associates Training,” which is designed to teach these employees how to deliver a guest experience that exceeds expectations and reflects the “Ozark Mountain Spirit.” FACETS Training will be held Monday, April 15 from 9:00 a.m. until noon aboard the Showboat Branson Belle. All area businesses are encouraged to send front-line associates to this training. For more information, or to register for the April 15, 2013 FACETS workshop, please visit www.Legacy-U.org or call (417) 598-1314. 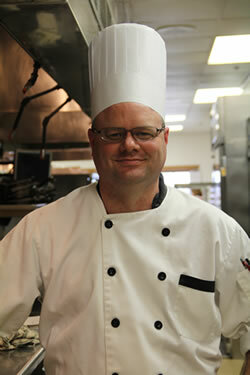 College of the Ozark Keeter Center Kitchen Supervisor and adjunct culinary arts instructor Christopher Freeman received the “People’s Choice” award March 11, at the Springfield/Branson Taste of Elegance competition and dinner. Sponsored by the National Pork Board, the Taste of Elegance inspires different ways to feature pork on the menu. As one of the major cooking events for professional chefs in the industry since 1987, The Taste of Elegance competition has evolved into more than 20 annual regional competitions, including the Springfield/Branson event. Ten area chefs competed in this year’s competition which offered pork entrées to 300 invited guests, who then voted on their favorites. Senior culinary arts majors Chani Bailey and Austin Merath helped Chef Freeman prepare his winning meal. Hospice Compassus and Hamner Barber Theater will host a special screening of Honor Flight, a heartwarming documentary about World War II veterans on a trip of a lifetime, on Sunday, April 28 at 3:00 p.m. at the Hamner Barber Theater in Branson. Tickets are free for veterans and $6 for the general public, with 100 percent of the proceeds benefitting Honor Flight Network. Purchase tickets online at http://honorflightathamnerbarbertheater.eventbrite.com/ or call the Hamner Barber Theater box office at (417) 334-4363. BRANSON, MISSOURI – March 19, 2013 – The Andy Williams Moon River Theatre announced today another performer in a line of stars to headline this Fall’s “Moon River Weekends”. Moon River Weekends is a concert series featuring national entertainers each weekend in September and October. Country Superstar and Grammy winner, Randy Travis will come to Branson and perform on Friday and Saturday, October 11th and 12th at 8pm. Tickets will be available for purchase beginning March 25th at 9 AM. One more performer in this exciting concert series will be announced in the coming days. Currently, Randy Travis is celebrating the 25th anniversary of his award-studded career with a stellar cast of collaborators on a new cd. Joining him on his Anniversary Celebration CD are such members of the Country Music Hall of Fame as Willie Nelson, Kris Kristofferson, George Jones and Ray Price. Current Nashville hit makers Zac Brown Band, Carrie Underwood, Kenny Chesney, Tim McGraw, Josh Turner and Brad Paisley are also singing with him on the collection. Rock ‘n’ Roll Hall of Fame member Don Henley is on board, as are such up-and-comers as country’s James Otto and Jamey Johnson, pop’s Kristin Chenoweth and Irish tenor Eamonn McCrystal. Randy Travis is a country and gospel music singer whose distinctive baritone and traditional style have made him a star since the 1980s. In the late 1970s he began making demo tapes and recorded a few singles, and in 1981 he moved to Nashville, Tennessee. After a few years as a cook and singer at night spot, he released an independently produced live recording to capitalize on his increasing fan base. His first record on a major label, Storms of Life was released in 1986, and Travis toured the United States on the strength of the hits “On the Other Hand” and “1982.” Since then he has sold millions of records and won numerous awards, including Grammys for Best Male Country Vocal Performance (1987 and 1988), Best Country Song (1988’s “Forever and Ever, Amen”) and Best Southern, Country or Bluegrass Gospel Album (2004’s Rise and Shine). Travis is known as a country crooner in the style of Lefty Frizell and George Jones. In recent years he has recorded bluegrass and gospel albums that have had great success, including the hit and 2003 CMA Song of the Year, “Three Wooden Crosses. With lifetime sales in excess of 20 million, Randy Travis is one of the biggest country record sellers of all time. College of the Ozarks, in conjunction with the American Red Cross, will offer the “Learn to Swim” program April 8-18 at the Howell W. Keeter Athletic Complex Natatorium. Lessons are offered to children ages six months through 15 years. The “Parent and Child Aquatics” program, available to students six months to four years old, will run 5–5:25 p.m. nightly. The “Learn to Swim” program, available for students ages 5-15, will be offered in two different sessions. The first session will run 5:30-6:10 p.m., and the second is offered 6:15– 6:55 p.m. Participants will be divided into groups based on abilities, and each group will have its own instructor. There are eight lessons in the program. The registration fee per student is $60, and is required at the time of registration on April 8 at the College of the Ozarks pool. Participants may register beginning Monday, March 25, by calling Associate Professor of Physical Education Bill Keeter at (417) 690-2567 or the C of O Athletic Department at (417) 690-2393.